Sometimes I think this is my favourite salvia for all round performance. It is a twiggy evergreen shrub 2m high + if you don’t have frost to lower it. The small flowers in bunches are a lavender blue but the best thing is the beautiful smell. 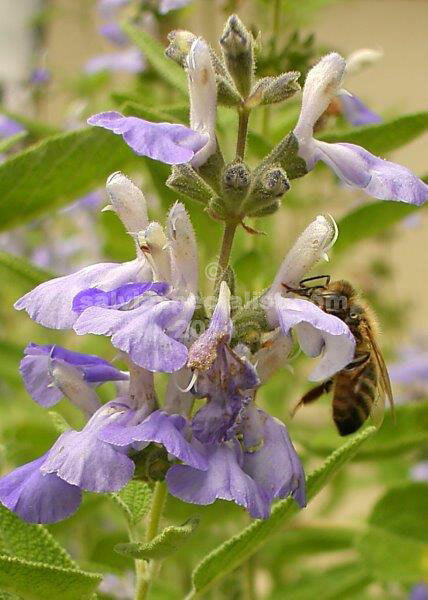 Both the flowers smell and the leaves which is unusual for salvias and they are two distinct perfumes. The flowers even release the perfume in warm conditions without having to be touched. Mostly it is the foliage of salvias which smells and not necessarily the flowers. The flowers of melissodora have a grape smell. It would probably flower year round in a warm climate but still flowers a lot where the climate is not so agreeable. Melissodora is frustratingly difficult to grow by cutting for an average gardener though there may be some time of the year when it is not hard. It does set seed and I grow them from that usually. It might take some practise in finding the seed. It is not easy to acquire because of the propagation difficulty. I also like melissodora’s agreeableness in growing and flowering in shade on the south or full sun on the north side in Albury. It tolerates a lot of drought once established. Originally I incorrectly spelled this MelissAdora and my labels are spelt incorrectly but they charge too much to make corrections to the template! Limit of one per order. Almost out of stock.